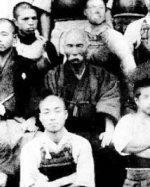 Master Mas Oyama believed in the warrior’s maxim of ancient Japan, Ichi geki, Hissatsu (One strike, certain death). This means that every time he aimed a technique at someone, he attempted to make it the perfect attack. One night while at a dance, Mas Oyama came to the aid of a girl who was being accosted by a thug. The troublemaker, already suspected of murder, pulled a knife and lunged prompting the karateka to block and counter with a head punch; the blow killed the assailant outright which devastated Oyama. To atone, he went to work on the farm where his opponent’s wife and child lived, staying until she was financially capable of running it and assured him that she did not hold him responsible for the death of her husband. 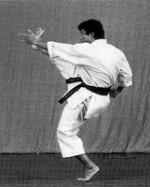 As well as fighting in over 270 one-on-one contests, Mas Oyama participated three times in his famous one-hundred man kumite. He invented this to further test his abilities by taking on one fighter after another over the space of three days. It is rumoured that the first time he did this, he wanted to go a fourth day but none of the participants were willing to carry on over the agreed upon period. "A human life gains lustre and strength only when it’s polished and tempered". Sosai Masutatsu Oyama, commonly known as Mas Oyama, was born into an aristocratic family in a small village in South Korea in 1923. At the age of 9, he began studying Southern Chinese Kempo under the tutelage of Mr Yi, an employee on his father’s farm. Then at the age of 15 he moved to Japan where he joined the Yamanashi Youth Air Force Academy and then the Imperial Japanese Army. 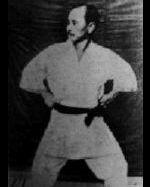 Later the same year, he became the student of Gichin Funakoshi and by 1941 aged 18, he was already a second Dan black belt, progressing to fourth Dan before he was 21. 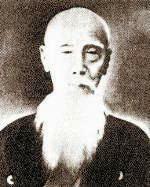 Oyama would always refer to Funakoshi as his true karate teacher and would later state that of all the things he learned from the founder of the Shotokan system, kata was the most important. 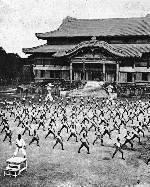 After the end of World War Two, Oyama began to train under fellow Korean Nei-Chu So, an exponent of the Goju Ryu style and one of Gogen The Cat Yamaguchi’s best students. 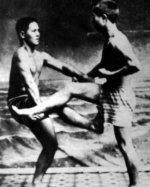 He also took up Judo at this time and within four years was a fourth degree black belt in the discipline. After becoming disillusioned with his martial arts training, Oyama decided to throw everything he had at it so he went to the top of Mount Minobu in the Chiba Prefecture, the same place the great samurai Miyamoto Musashi is said to have received inspiration for his double sword system. He would rise at five in the morning and once his training was done, would read extensively from martial arts manuals and from Buddhist texts. He would finish the day with contemplative meditation; it was here that he began to develop the ideas that would form his own style, kyokushin karate, and where he first though of the idea of testing his abilities by fighting a bull. When he left the mountain and returned to civilisation, he entered the first All Japan Karate Tournament held in Kyoto, which he won. Despite his victory, he still felt that something was lacking in his karate so he went back into isolation, this time heading for Mount Kiyosumi for another year of fourteen hour a day training sessions and continuous contemplation and reflection. When he returned, he decided that he wanted to take on the ultimate challenge in a life and death contest with a bull (pictured above). He undertook this challenge 52 times; three of them were killed instantly by his strikes and 49 had their horns taken clean off by his knife hand strike. While this seems a little untoward to the modern reader due to the cruelty to animals aspect, it must be remembered that this was in the 1950s and people had a totally different mentality then (the animals he fought were also all ready for slaughter so would have died anyway). As a feat of strength, bravery and a demonstration of devastating technique, Mas Oyama’s bull fights are unparalleled. That said, his first attempt in 1957 did not go too well and even though he eventually won, he was bed ridden for six months from injuries sustained from the fight. Not content with fighting dumb animals, he also took on more than 270 people over the years, many of whom were beaten with one punch; most contests lasted a matter of seconds and none over three minutes. Oyama had made his bones so strong that even when his attack was blocked, he would break the bones of his opponent’s blocking arm and while his hands were legendary, he was also known for his powerful head kicks. He travelled the world to fight, teach and establish dojos; he would fight anybody from any style and in doing so gained enough fame to make his style, kyokushin karate (the search for the ultimate truth), one that is today practiced worldwide with over 15 million members. 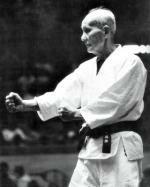 His legacy also includes a number of books that are amongst the most read karate books ever. At the age of 71 in 1994, Master Sosai Masutatsu Oyama died, losing just about the only battle of his illustrious life, to lung cancer. Grant, T. P. [Internet]. 2012. Gods of War: Masutatsu Oyama. Available from: http://www.bloodyelbow.com/2012/5/20/3016355/gods-of-war-masutatsu-oyama-mas-kyokushin-karate-kumite-full-contact-karate [Accessed July 18, 2013]. Legacy Masters. [Internet]. 2011. Mount St. Mary’s University. Available from: http://www.msmary.edu/student-life/recreation/club-sports/phoenix_karate-do_association/legacy_masters.html [Accessed July 18, 2013]. Masutatsu Oyama - Sosai's History. [Internet]. 2013. masutatsuoyama.com. Available from: http://www.masutatsuoyama.com/en/home/masoyama.htm [Accessed July 18, 2013]. Sosai Masutatsu Oyama. [Internet]. 2013. Great Basin College. Available from: http://cot.gbcnv.edu/~karate/pages/mas_oyama/cnt.akk.mas-oyama.html [Accessed July 18, 2013].